Magnolias and Men M/M Romance With a Southern Accent: Torquere Press Ninth Anniversary! Torquere Press is celebrating their ninth anniversary, and you get the gift! Click on the icon above to visit the official site and register for one of many fabulous prizes. ANYONE KNOW WHAT THE NINTH ANNIVERSARY GIFT TRADITIONALLY IS? Leather, something near and dear to our hearts here at Torquere Press. To celebrate our 9th birthday, we're having gift basket prizes, blog posts from some of your favorite authors, and our grand prize, a brand-new Kindle Fire to say thank you for all your support over the years and to highlight our wonderful authors who bring us such amazing stories. Check our blog, http://glbtromance.blogspot.com/ where we'll be hosting a new author every day. We'll post excerpts, hang out to chat, and talk about our stories. In addition to the grand prize of the Kindle Fire, we're giving away gift baskets every week! Some are silly, some are smutty, and all are fun. To help celebrate, they're also holding a Ninth Anniversary sale. 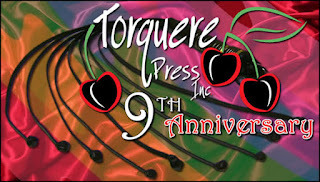 September starts the month for the 9th Anniversary of Torquere Press! The 9th anniversary traditional gift is leather! Well leather is something near and dear to our hearts here at Torquere Press. So we are having a anniversary kick-off sale. Just put 'annivkick' in the coupon code box any time you check out at Torquere Books before Monday at midnight to get 20% off your order. Sale good now through Monday, September 3rd at Midnight (est). Stock up on books from Torquere Press today. Go celebrate with savings from Torquere Press!